The Voice Kids Philippines Season 3 grand winner will be named tonight, Sunday, August 28, 2016. The Voice Kids Philippines Season 3 grand champion will be announced at the end of the live Grand Finale results show tonight at the Resorts World Manila. The Top 3 including Justin Alva, Joshua Oliveros and Antonetthe Tismo will return to stage tonight to compete for the grand prize. For the final round, the Top 3 finalists will perform a power ballad. Viewers will decide who will be crowned as The Voice Kids Philippines Season 3 Grand Winner. The public votes for tonight will be added to the partial tally. The Voice Kids Philippines Season 3 ‘The Final Result’ airs Sunday night on ABS-CBN. Who do you think will win? Write your prediction on the comment section below. Bookmark this link, live final recap and videos will be added on this page once uploaded online. Refresh page for updates! 3rd Place: Justin Alva 25.24%. 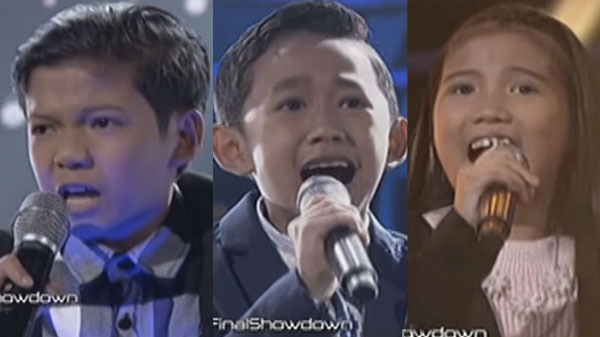 What can you say about The Voice Kids Season 3 results? Share your comment on the discussion box below.